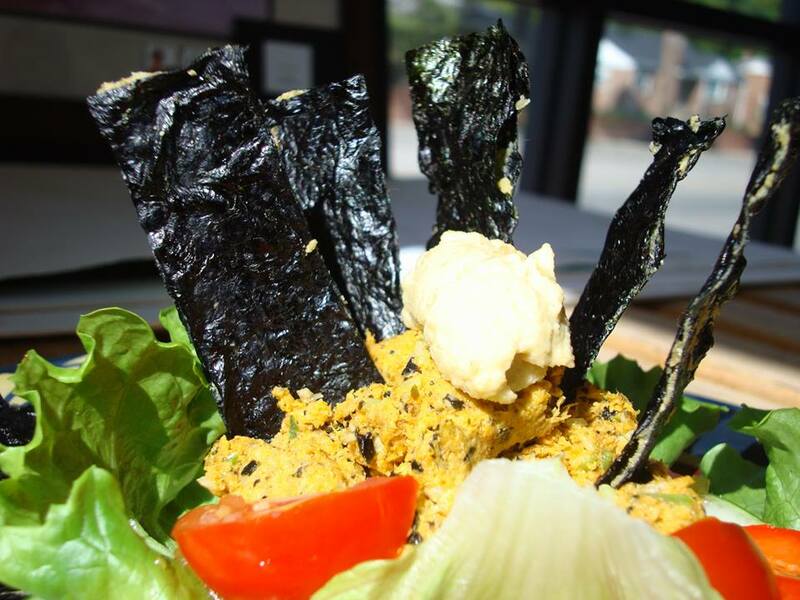 The items below are just a sample of some of our most popular dishes at our Rawtopian Bliss Gourmet Raw/Vegan Deli, which is now open to the general public. Enjoy the 100% vegan, organic, and non-GMO version of your favorite comfort foods --without any of the regret or guilt! Calling your order in advance helps our kitchen run more smoothly. PLEASE CALL IN YOUR ORDER AT (803) 518-8927. Phone lines are open as early as 10AM. Live Cheeze stuffed into vegan shells and rolled into little crescents. These Live Cheezy Hummus rolls can be eaten like popcorn or can accompany a great meal. Sixteen to an order and meant to SHARE! Fresh Organic Kale chopped finely with Quinoa added and tossed in our savory Goddess Dressing. Garnished with Olives, Peppers, tomato, and topped with Avocado. Comes with 3 Humus Rolls. A savory SaaSage-spiced Tempeh filling with Live Seed Cheeze wrapped in a Vegan Tortilla Shell and lightly toasted with a sweet & savory sauce. Comes with a crisp side salad. 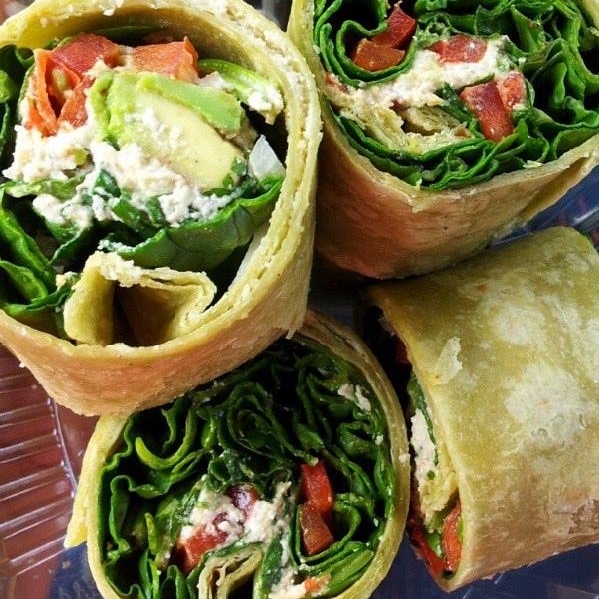 This Asian delight is wrap in Nori Seaweed and filled with seed cheeze, avocado, cilantro and fresh salad greens. Comes with Side Salad & Sesame Dipping Sauce. $12.50. Kale, Purple Cabbage, Carrots, Walnuts, Green Onion, Bell Peppers, Raisins, Quinoa, garnished with Tomato, marinated in a Sweet Sesame Dressing and 3 Humus Rolls on the side.. SEAFOOD CELEBRATION MEAL comes with a fully loaded Salad, 3 Humus Rolls, Field Peas and Lightly Steamed Vegetables over Quinoa, and our Plant-based Seafood Patty (made from Carrot fiber), seasoned to perfection and topped with our very own Spicy TarTar sauce. Spiralized Zucchini Pasta Noodles with Fresh Herbs & Marinara Sauce, with 5 plant-based Italian SaaSages, seasoned perfectly to taste like traditional Italian Sausages. Comes with Fresh Salad Greens and 3 Hummus Rolls. Romaine Lettuce with our own freshly made Croutons with Tempeh UnChiken. These tasty tacos rest on a Romaine Lettuce Leaf with Live Cheeze, Fresh Salsa, our Tempeh Taco Blend and a raw Sour Cream Dressing. 4 Tacos per order. A Mexican Fiesta on a bed of organic Corn Tortilla Chips with Spring Mix Salad Greens, Quinoa, Tempeh Meaty Mix, Zesty Sweet Salsa, topped off with our Live Seed Cheeze and our Goddess Dressing. A Party in your mouth for certain. QUESADILLA w/Guacamole & Fresh Salsa (80% Raw) $12.50 Our Fresh seed cheese sandwiched in between 2 Vegan tortilla shells lightly browned and cut into 8ths, topped with Guacamole, our Sweet Zesty Salsa and Sour Cream Dressing. Our plant-based Tuna Melt is seasoned to taste just like real Tuna and served on Onion Bagel with Seed Cheeze, Lettuce, Tomato, accompanied by Chipz & Cheeze.